This provides pets with a greater freedom of choice and extends the areas in which they can self-exercise and explore. The flexible, soft flap is tinted and adjustable. A magnetic flap closure and pile weather stripping along the sides of the flap opening form a weather-resistant seal. 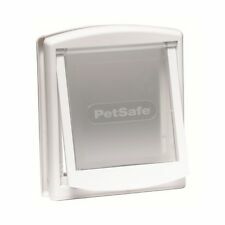 PetSafe Pet Flap 600 Aluminium <7 kg 5013. 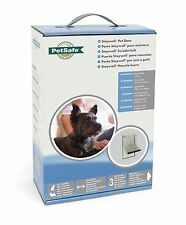 This PetSafe pet flap 600 provides your pet with all the independence to enter the house without your having to open the door. The flexible, soft flap is tinted and adjustable. This PetSafe pet flap 640 provides your pet with all the independence to enter the house without your having to open the door. 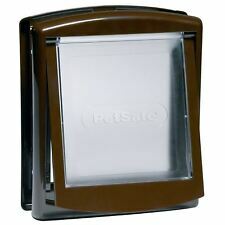 PetSafe Pet Flap 640 Aluminium <45 kg 5015. The flexible, soft flap is tinted and adjustable. 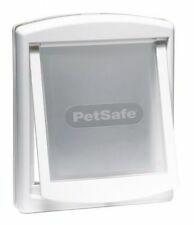 PetSafe Pet Flap 620 Aluminium <18 kg 5014. 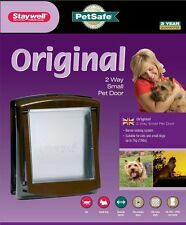 This PetSafe pet flap 620 provides your pet with all the independence to enter the house without your having to open the door. The flexible, soft flap is tinted and adjustable. 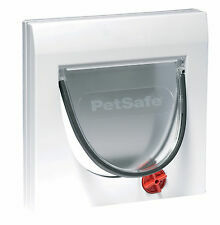 PetSafe Pet Flap 660 Aluminium <100 kg 5016. This PetSafe pet flap 660 provides your pet with all the independence to enter the house without your having to open the door. The flexible, soft flap is tinted and adjustable. Aluminium Large Pet Door 640 Heavy Duty White finish with. Accessories Dog & Cat Doors Dog & Cat Doors. For large dogs up to 45kg 100lbs. Maximum pet shoulder width 260mm 10 1 / 8. Cut out size 451mm x 277mm 17 3 / 4 x 10 7 / 8. This will allow you to tempt pets through using a favourite treat. Once your pet is comfortable, the flap can be replaced. Above all – be patient with your pet. Pet Doors are pushed open by pets and do not require constant authorisation from the owner. 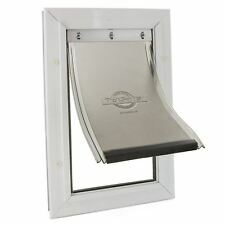 Aluminium Small Pet Door 600 Heavy Duty White finish with. Maximum pet shoulder width 132mm 5 3 / 16. Linked MPN 600ML. Cut out size 245mm x 150mm 9 5 / 8 x 5 7 / 8. Overall size 298. 7mm x 201. 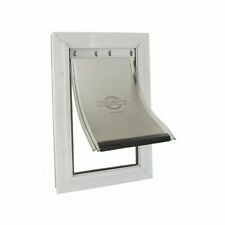 Aluminium Pet Doors Heavy Duty White finish with Flexible Flap. Accessories Dog & Cat Doors Dog & Cat Doors. Linked MPN 620ML. Maximum pet shoulder width 132mm 5 3 / 16. Cut out size 245mm x 150mm 9 5 / 8 x 5 7 / 8. 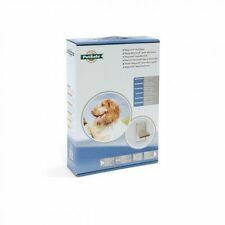 For dogs up to 3kg (7lbs). Overall size: 298.7mm x 201.69mm (11 3/4 x 7 15/16"). Cut out size: 245mm x 150mm (9 5/8" x 5 7/8"). Free gift when you spend over £25 on any cat products! Subject to change and availability. for cats plastic keeps foreign pets outside all cats can go out, but only cats with corresponding microchip can come in again with microchip identification or RFID collar tag (available separately) due to extra mounting adapter suitable also for glass doors (available separately) can be programmed for up to 32 cats transparent flap, low noise level installation depth 3–60 mm can be extended with tunnel elementstotal measurements 21 × 21 cm cut out size 16.5 × 17.1 cm flap size 14.2 × 12.0 cm battery run (4 AA mignon batteries not included) with display showing low battery power 3 years guarantee .